The next 7 days will remind everyone that late July is climatologically the warmest period of the year. Much of the rest of this month will be dominated by an upper-level wind flow sometimes referenced as an “Omega” (Ω) pattern. There will be a trough (dip) in the jetstream along both the west and east coasts of the United States. That will create a ridge of high pressure in the Great Plains from Texas to Canada. If you examine Figure 1 you can somewhat imagine the jetstream looking like the greek letter Omega. This shift from periodic days of cooler air over the past week to consistently warm and humid weather started Wednesday (today) and is expected to continue through at least Monday. The upper-level wind will be from the west or southwest, but the near surface flow will frequently be from the south advecting Gulf of Mexico moisture into the region, meaning humid conditions are expected through early next week with above average temperatures. This will bring bountiful growing degree units to the area, but also have the potential to add disease risk with high relative humidity levels on several occasions. 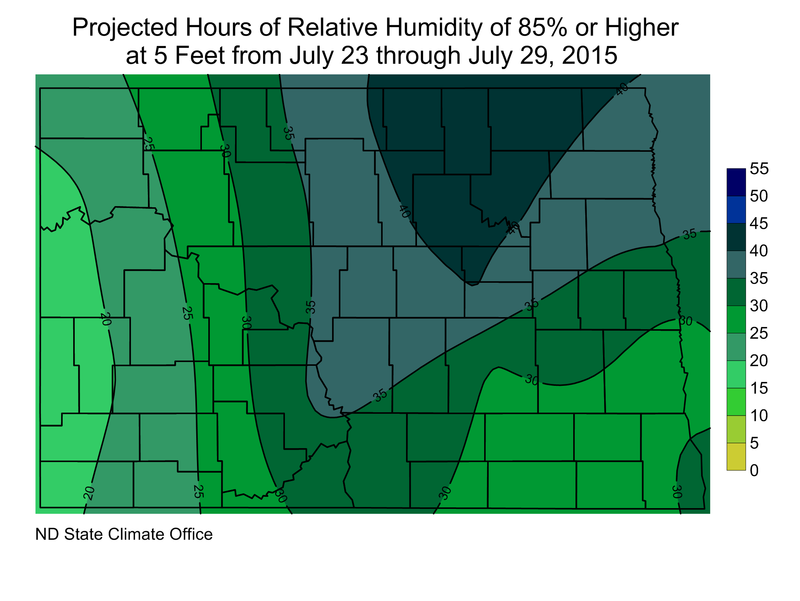 That will be particularly true in the eastern part of North Dakota into northwestern Minnesota. With dew points at least in the 60s with some periods perhaps even as high as the lower 70s, any thunderstorms that do develop would have the potential to drop heavy rainfall in localized areas. There appears to be two time frames for thunderstorm development during this forecast period. One will be later Thursday into Friday morning, and again early next week (later Monday into Tuesday). Although specifics for early next week are lacking, the storms that do develop Thursday will probably have some localized severe weather potential as well as that risk for heavy downpours. The thunderstorms early next week will be associated with a brief cooling period that is expected to last only one or two days. 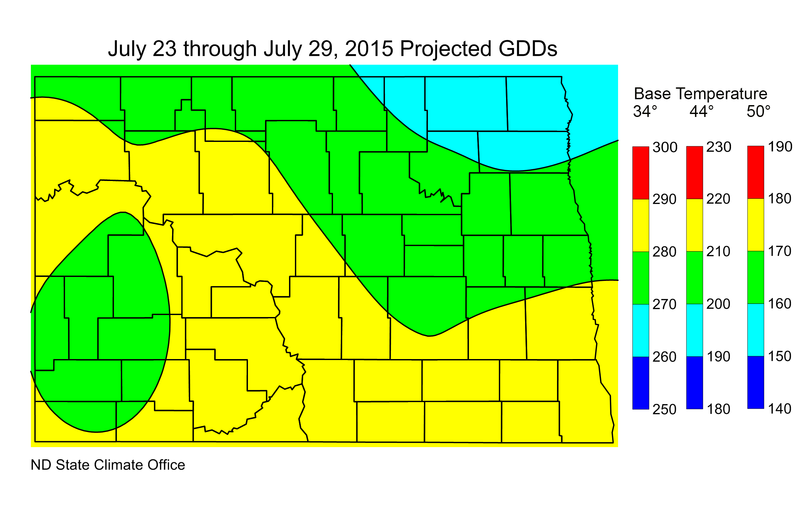 Projected Growing Degree Days (GDDs), base 34°, 44° and 50° for the period July 23 through July 29, 2015 are presented in Figure 2 and the number of hours expected to be at or above 85% can be found in Figure 3.